Sir Alec Guinness (1914-2000) had so many memorable roles over his lifetime that it is nearly impossible to choose a favorite. His turn as Colonel Nicholson in The Bridge Over The River Kwai won him his first Academy Award, and his portrayal of Obi Wan Kenobi in Star Wars (1977) will never be forgotten. Following Star Wars though, he opted to bring his considerable talents to the small screen. For many fans, his portrayal of George Smiley in the BBC production of Tinker, Tailor, Soldier, Spy was his finest television moment. For an actor with such considerable catchet to appear in a TV program, the script obviously needed to be something special. And so was the case with John Le Carre's classic Cold War spy drama. Tinker, Tailor, Soldier, Spy was a sensation when it was originally aired on the Beeb back in 1979. Acorn Media specializes in releasing classic British programs on DVD, and their new three-disc set of the six-hour miniseries does not disappoint. The story begins with British agent Ricki Tarr discovering that there may be a Soviet double agent working in the British Intelligence Services. Tarr alerts his superiors, who bring in the retired George Smiley to investigate. Smiley and his boss must operate undercover, as nobody knows who the mole may be. The intricate story involves a number of red herrings, double-crosses, and false leads. One of the great joys of watching such a well-written tale as this is the fact that anybody could be guilty. Guinness is a joy to observe onscreen, as he is anything but the "James Bond" figure one might expect. Rather he is an older, very wise agent, who still does not know all the answers, and is continually surprised as the story unfolds. Smiley eventually discovers that the intrigue and espionage goes all the way to the top of the organization, which is referred to as the "Circus." Moscow has induced the Circus leadership to believe that one of the spys has protected his cover by feeding them minor British intelligence. As a result, the leaders of the Circus have suppressed any rumours of a mole, inadvertently protecting him. Smiley contrives a trap for the spy, and heads roll. He is then appointed temporary head of the Circus to deal with the aftermath. This not only provides for a very intriguing six-hour miniseries, but leaves the door open for the sequel, Smiley's People - which aired in 1982, again starring Alec Guinness. In addition to the full series, the Acorn DVD set includes a fascinating 28-minute interview with author John le Carre, production notes, a glossary of the main charcters and terms, cast filmographies, and a biography of le Carre. 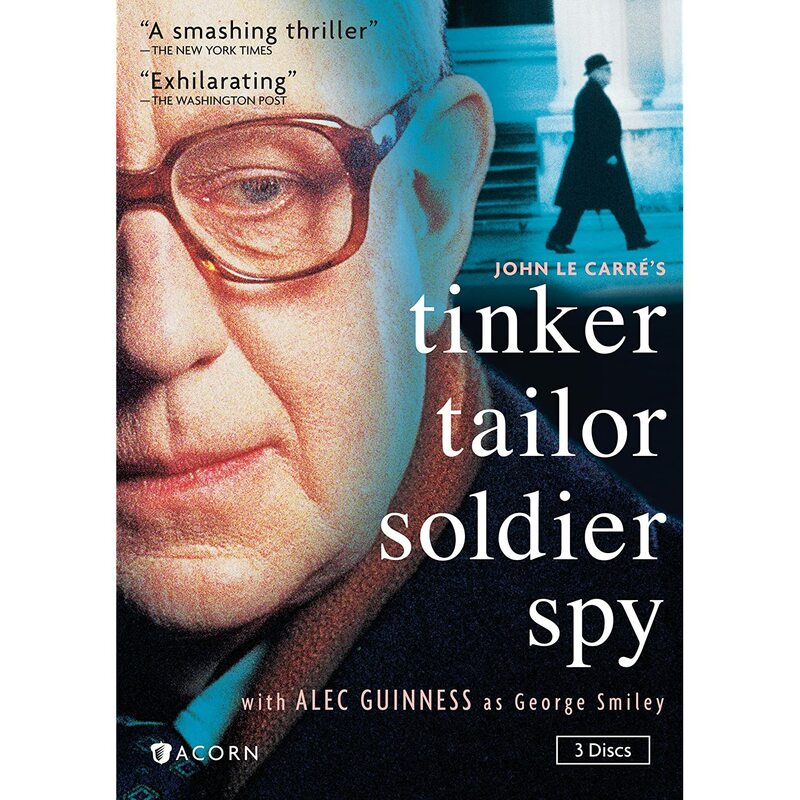 The timing of the set's release coincides with the feature film adaptation of Tinker, Tailor, Soldier, Spy starring Gary Oldman as George Smiley -- set for release on December 9, 2011. Acorn has also released Smiley's People to DVD, which will be reviewed here shortly.